I am probably not your typical homeschooler. When I first began 18 years ago I was way more structured and rigid. I even got my daughter a little school desk for her to sit in. (And apparently, according to my husband, I made her call me Mrs. Walden. Neither she nor I remember that, thank goodness!) The desk lasted all of about two days. Her little brother was about 20 months old at the time and into everything. Staying in one spot for any length of time was a chore. In my first couple of years I bought some sort of curriculum with a guide I could check off as done each day. I was not happy when I didn’t get to check something off. Security meant following someone else’s ideas of school because, surely, they must know more than me. They had to know just the right books to read, the correct phonics program to use and the best math flash cards to buy because I had no clue what I was doing. Back when we started in 1994 I didn’t know anything about learning styles, character development, curriculum choices or support systems. I just knew I wanted to spend time with my kids and teach them to read and write and do math. 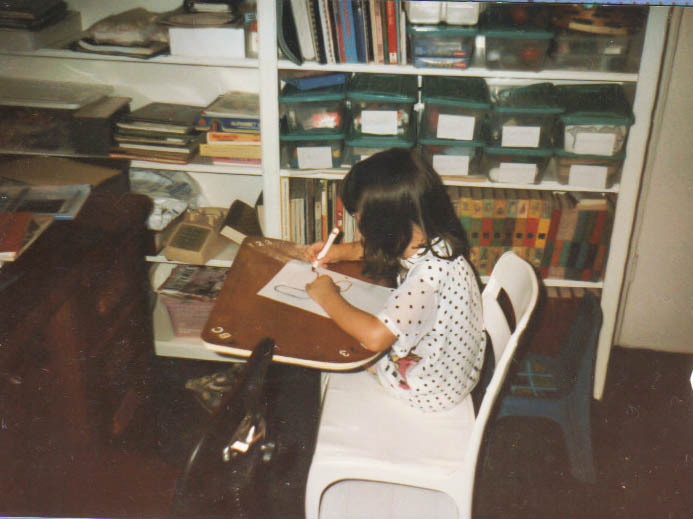 I wanted them to love learning as much as I did and be excited about books and games and family time. I wanted to show them God and raise them up to be godly men and women. All I knew was I wanted to have “good” teenagers and not dread those years. The only way I knew how to do that was through the time we spent living life together. I had no idea when I started homeschooling that we would adopt three more children in 2000 who would eventually blow everything I believed about homeschooling methods out the window! I didn’t know my bio kids were neuro-typical and fairly easy to homeschool. Nothing like the emotional, mental and physical needs of my adopted kiddos. I was in for a roller coaster ride! I do believe that the foundation that was laid in those first few years of homeschooling sustained me in the years of turmoil, frustrations and fears. Staying home to teach my kids allowed us to blend into a new family, warts and all. Struggles and battles lay ahead but we have persevered on our homeschooling journey through it all. Homeschooling special needs children, whether it be physical, mental or emotional, is both a joy and a challenge. We are entering year 19 of homeschooling and in many ways I feel like a dinosaur. However, I don’t have all the answers or pretend to know it all. Each year is different, filled with life circumstances and struggles unique to that time. I cling to those same desires from my early years. I want my children to desire God, love learning and live life to the fullest, equipped with a foundation of knowledge and relationships that will endure. With all that said, I am probably not a typical homeschooler. I no longer plan out every day, week and month. I actually don’t really “plan” at all in the sense that I don’t have a daily goal that has to be met. I can’t live with the feeling that I didn’t accomplish enough or get enough done. I had to experience the death of perfection to realize God wants me to teach my children how to live, not just do worksheets or sit at a table and check off a list. In the very difficult years of raising children of trauma, taking care of my elderly parents and homeschooling through it all, the transparent truth was there were many days that my only “goal” for the day was to get dinner on the table. That was it. If I cooked a homemade meal for us all to share together I had done enough for that day. Does that mean school didn’t happen? No. Does that mean the day might have involved visiting my parents, doing their laundry, paying their bills, managing 60 years of their possessions together and talking to numerous doctors? Yes. It may have also involved hours of therapy dealing with past and present wounds and emotional traumas and abuse for my adopted children. Did I also take children to jobs and piano lessons and church activities? Yes. Did we do math? Yes. Did we read together? Always. Did we do devotions? Absolutely. Was every day the same? Never. Did I do every single one of these things every day? No. So what does this look like in our lives? How do I figure out if my children are doing “enough?” For each year I have an over arching goal/desire for my kids. When I had all five at home I was more organized and precise and detailed because it made me feel better to write down what we had done. It didn’t make me a better teacher or make them learn more. It just made me feel more secure. Oh, the things God continues to teach me! He wants me to rely on Him, live one day at a time and not waste today worrying about tomorrow. This year I’ve decided the hill I’m ready to die on (the over arching “goal”) is communications. Now that sounds like a fancy college type class, but to me it is the ability to both speak and write clearly. My youngest two are in 8th grade, and I have felt the pressure to be more consistent and disciplined, and dare I say it, firm? Homeschooling children with attachment disorder presents unique challenges, but my kids have made such strides in healing that I feel it’s time to push them in areas of academics that will prepare them for life. My two struggle with expressing their thoughts in spoken language. This is an area where we obviously have plenty of opportunities to practice. We are also working on body language and social cues, learning how to be unique without acting out for negative attention, increasing vocabulary and using correct grammar. I am also emphasizing their written language skills, implementing the same grammar and language tools through their writing. My daughter can write for pages with nary a paragraph in sight. My son writes much younger than his age because he doesn’t want to misspell a word and have to look it up. He wants it perfect the first time so he doesn’t have to do it again. They are practicing their writing skills through snail mail and assignments that help with organization and thought processing. It is very often a struggle but we will push through. The benefit of years of homeschooling? Seeing the results in the lives of my adult children. Rachel is happily married, working full time and living with her husband in their first purchased home. Joshua is starting his second year at Southeastern Baptist Theological Seminary majoring in Christian studies with an emphasis on music. He has done well academically as well as personally, spiritually and emotionally. Both my kids are well adjusted, smart, funny and fun to be around. I thank God for them each day and am grateful to have no regrets for having invested so many years in their lives. I talk to both of them almost every day, through calls, texting, email or facebook. Our family get togethers are tightly held, joyfully celebrated traditions that are unique to us. The truth behind homeschooling? Each day is an opportunity to model love and faith in front of our children, showing and receiving grace from each other. Academics matter but they are not everything. Academics are merely the tool we have chosen to teach and help our children practice real life. Would you like to know more about a day in the life of a homeschooler? How about the lessons learned in a corn maze? Do you know how to create your own unit study? Join us as put real life homeschooling and coupon math to the test. Thank you for this. I needed to hear all of it. I’ve been homeschooling for 13 yrs now, have graduated my oldest (who is now married) and am into my first year of homeschooling my newly adopted RAD son. I want to give up, throw in the towel and put EVERYBODY in school (I’ve got 5 kids at home still, I did send my kindergartner to school this year, who also has RAD). I’m just done. My son just revealed to me he’s been faking his lack of knowledge for the pas 4 months, pretending to not know things. I am angry and just.done. So thank you for this post. It comes at the perfect time, of course b/c our God is great! You’ve given me hope and that’s something that doesn’t come easy anymore.